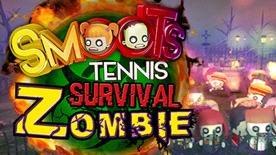 Save your Smoot from the hordes of Zombie Smoots. After Halloween, the hell has arisen and all Smoots have become Zombies, you have to save yourself and eliminate all the Zombies on the cemetery in order to extinguish the Zombie apocalypse. After Smoots World Cup Tennis, Kaneda Games have developed the Zombies minigames for VR, use your racket and destroy all the zombies with your balls of fire.